FLASKS FILTERING HEAVY WALL WITH TUBULATION "LABGLAS"
- Type: Made of Borosilicate Glass. We are a remarkable entity in this domain, engaged in offering a qualitative assortment of Flask Filtering. We are engaged in offering a wide range of Filtering Flasks to our valueable customers. These are widely used in various sectors. Our products are obtained from the most trusted vendors of the market. These are easily available at a very low market rates. 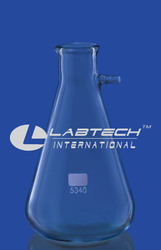 Filter flask in compliance with ISO 6556 & USP Standard. With our in-depth knowledge in this domain, we are actively engaged in offering an excellent quality assortment of Filtration Flask. Made from high quality heat resistant Borosilicate glass. The Vacuum Filtering Flask has a much heavier wall and rim than a standard Erlenmeyer flask making it extremely strong and durable. Available in all capacities ranging from 100ml to 1000ml.